Retiring? Laid-off due to oil crash? Job change? This webinar will cover the “trips and traps” that people make with their financial planning. At the beginning of this year, I began discussing the technical weakness that was emerging in the markets. Since that time, the markets have remained under pressure leading to a continued cautious portfolio stance. “Mr. Draghi pledged to flood the financial system with fresh liquidity for as long as it takes to keep the fragile economic recovery alive and prevent a deflationary psychology taking hold, yet there was a sting in the tail. The question, of course, is whether the ECB’s interventions will be able to change the longer-term dynamics in the Eurozone by creating inflationary pressures and sparking economic growth? That answer is likely “no” as it has failed to do so in the past, not only in the Eurozone but also in Japan and the U.S. While I am going to spend most of this week’s missive re-evaluating the technical underpinnings of the market, I want to start with a quick review of the fundamentals. As I noted earlier this week, corporate earnings continue to deteriorate. 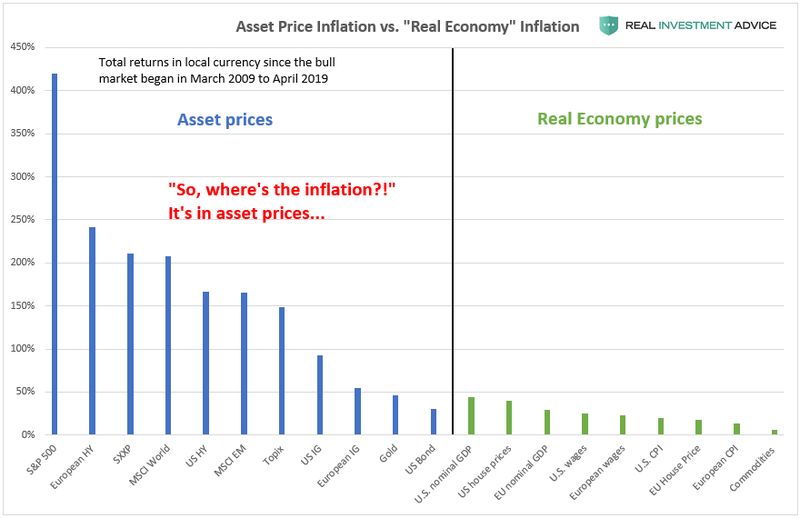 More importantly, despite ongoing Central Bank interventions which boost asset prices and acts as a huge wealth transfer tax from the middle class to the rich, corporate earnings are a direct reflection of what is happening in the actual economy. “Earnings turned negative either during or just after all 12 of these recessions. This should come as no surprise. Also noted on the chart are the five instances when earnings turned lower (at least two consecutive quarters) without a recession. The point here is that Central Bank interventions likely can not fix that problem in the longer term. While liquidity injections have the ability to “Rob Peter To Pay Paul” by dragging forward future consumption, it continues to enlarge the future consumption void when it inevitably arrives. The economic picture, not surprisingly, is not doing well either and, as stated above, is being reflected in current earnings growth. While many pundits have tried to suggest “this time is different” because the “service” sector has not fallen into contraction, this may be presumptive as the “trend” of the data suggests this is not the case. The same can be seen in the Economic Output Composite Index (EOCI) which is comprised of a variety of broad indices including the Chicago Fed National Activity Index, Chicago PMI, several Fed regional manufacturing surveys, ISM composite, NFIB survey and the LEI. The last three times this index has fallen towards these current levels the Federal Reserve intervened. Lastly, imports and exports are the “blood” in the veins of both corporations and consumers. Exports make up roughly 4o% of corporate profits and imports show the strength of consumer demand. See any problems here? That help has not been, and will likely not be, forthcoming. As noted this past Sunday, BIS economists highlighted the fragile global economic backdrop and said negative interest rates could become a reality for many more countries as central banks search for ways to stoke real growth. “The tension between the markets’ tranquility and the underlying economic vulnerabilities had to be resolved at some point. In the recent quarter, we may have been witnessing the beginning of its resolution. Unfortunately, all one has to do is look at Japan to see the shortcomings and deteriorative impacts of negative interest rates. While the economic and fundamental backdrop are still waving very important cautionary flags, the recent rally in the markets in anticipation of both ECB and Fed support have turned the technical backdrop more constructive. However, has enough repair been done to change our currently cautionary stance more bullish? Let’s take a look. From a short-term, daily, perspective, the current rally is very similar to the one we saw last October following the summer swoon. The steepness of the ascent, amid continued overbought conditions, smacks of a short-covering rally and a scramble by markets for momentum. Given the “accommodative” stances of Central Banks globally, the current rally runs well in the confines of a reflexive rally. However, as shown in the chart above the current bearish trend remains intact for now. If we step back to an intermediate, weekly, perspective, a little clear perspective emerges. As shown below, while the recent rally has been extremely sharp, it is still confined to an overall negative price trend. Starting at the top of the chart above, it is important to note the declining trend of the overbought/sold indicator. The yellow highlights denote previous bear market cycles where the markets remained primarily oversold during the entirety of the reversion process. Moving to the bottom of the chart, there has been NO IMPROVEMENT in the intermediate “sell” indicator which also suggests that the current rally remains confined within an ongoing bear market trend. Note that this indicator has only been this negative during the previous two bear market cycles. Also, as I discussed last week, the current rally is still within the context of a standard Fibonacci retracement. The target of 2030, which I laid out in January of this year, is now being approached. As you will notice, that rally failed and actually broke previous lows. It was then the BOJ’s turn to provide support for the market, more promises from the G-20 and finally action from the ECB. Again, this rally looks an awfully lot like last October, but with with much weaker economic and fundamental underpinnings. Stepping out even further, on a very long-term, monthly, picture we see even less evidence the current advance is changing from a negative trend. The first chart shows the primary “sell” indicators going back to 1980. When the two lower indicators have aligned previously on a negative crossover, it has corresponded with either an intermediate-term correction in the market, a 1987-crash, or worse. The final long-term chart confirms the same showing a uniform alignment of all technical underpinnings showing NO IMPROVEMENT following the recent rally. In order for the market to change the current negative dynamics, which in turn would warrant a significant increase in long-term equity exposure, it will require a uniform improvement in the technical underpinnings and likely a breakout to all-time highs. Is such a turn possible? Absolutely. This is where having a strict investment discipline is tested. When markets rally strongly, the inclination by most is to ignore their discipline and chase markets. During bullish trending markets, such lapses in discipline are forgiven by steadily rising markets. However, during bear markets, such deviations are often brutally punished. If bull markets are a function of earnings growth, increased optimism and strengthening economic trends, then why did the ECB feel the need to drop a nuclear liquidity bomb? As discussed throughout this weekend’s missive, there is ample evidence suggesting a more cautionary approach remains the correct course of action for now. Therefore, we continue to wait, watch and prepare. Neither situation will make itself apparent in short order, so relax as we let the market dictate what actions we take next. “Guessing” at the markets has not typically been a successful and repeatable strategy. As stated above, while very short-term indicators have improved, the longer-term signals have not. “This analysis also suggests that the current correction in stocks is likely not over as of yet in the longer term. However, in the very short-term, the current oversold condition in rates suggests that the current “bear market rally”could last through the month of March. Such would not be surprising following a rather brutal first two months of the year. With interest rates back into overbought territory temporarily, the flight from “safety” to “risk” may be nearing its end. While rates could very conceivably push from Friday’s close of 1.98% to somewhere between 2.1% and 2.2%, such is not much room to play with. Therefore, I am beginning to scale into short and intermediate duration bonds over the next couple of weeks as rates continue to push slightly higher. I expect that I will be well rewarded by the end of this year as rates reflect the current underlying economic fundamentals and retest recent lows or lower. Again, this is just for educational purposes, and I am not making any specific recommendations. This is simply a guide to assist you in thinking about your own personal positioning, how much risk you are willing to take and what your expectations are. The closer you want to track the S&P 500 Index, the less fixed income, real estate and cash your portfolio should have. For a more conservative allocation reduce allocations to equities and add more to cash and fixed income. “Not surprisingly interest rate sensitive sectors, along with the more defensive sector of the market, Staples, surged last week as the 10-year Treasury plunged below 2%…again. The search for safe haven investments such as Utilities, Bonds, and Staples has become a more crowded trade as capital leaves the previous leaders of Technology, Industrial and Discretionary sectors. As noted above, I am now recommending beginning to scale back into “bonds” as the recent uptick in rates has reduced that overbought condition and have taken bonds to an underweight position in portfolios by reducing prices. Here is the updated SARM model. You will note that despite the recent rally, not much has changed since the end of January. Yes, risk assets have improved against safety assets, but not as significantly as one might expect given the sizable rally over the last several weeks. With markets once again back to extremely overbought conditions, and fighting a declining 200-dma, the advantage of adding significantly to risk assets at this juncture is likely not advisable. Therefore, there have been no changes to S.A.R.M. model in the past week. If the market can pull back and form a bottom at the 50-dma (establishing a higher low) and move the markets back into an oversold condition in the process, such would likely provide a reasonable opportunity to increase short-term equity exposure. However, for longer-term investors, we need to see an improvement in the fundamental and economic backdrop to support a resumption of the bullish trend. Currently, there is no evidence of that occurring. Such is critically important as economic growth is directly related to P/E growth and stock market returns. This is because earnings/profit growth is directly linked to economic growth. Therefore, over the course of a full-market cycle, corporate profits cannot indefinitely grow faster than the economy. While the market rally was quite exceptional over the last couple of weeks, it has done little to change the currently negative market trends back to positive. As shown in the 401k portfolio manager chart above, all sell signals remain in place currently, and while they improved slightly over the last two weeks, remain in the negative. That event was the ECB last week which gave a modest boost to stocks on Friday. The Federal Reserve is now up on deck as we head into the end of the month, which could either provide a further lift or a sharp decline. As discussed throughout the entirety of this week’s missive, the technical damage to the market remains over the intermediate and longer-term time frames. This suggests the reward is still outweighed by risk and continues to suggest a more cautionary allocation.